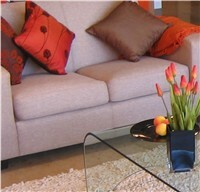 "The House Styling service by HouseWow was great from beginning to end. I would highly recommend their professional support when wanting to optimise market property price values. " Styling your House, Styling your rental investment or styling a renovation project or one off new build? If so then HouseWow! can provide a bespoke house styling service for your needs. House Styling or Property styling by HouseWow® provides a property furnishing and dressing service to residential and commercial clients, property developers, builders, landlords and property investors. We provide a unique service with a range of interiors furniture, dressing services and styling which improves the property selling value or rental value of all property. For styling homes all furnishings, furniture, curtains, kitchen packs, blinds, soft furnishings and accessories are sourced supplied and fitted. HouseWow professional House Styling Consultants offer property visit assessments, dynamic sourcing, top class customer service, fast turnaround and finishing touches for wow factor. We can source the best in both purchased and rental furniture, however our interiors service provides clients with a bespoke house styling scheme far superior to a standard furniture pack & accessory service. The HouseWow finishing touches which will set your property apart from the rest without you having to pay costly design house prices.